Anthony L. “Tony” Farese is 55 years of age and is the President of the firm of Farese, Farese & Farese, P.A. in Ashland, Mississippi. He received a B.PA. from the University of Mississippi in 1983 and his J.D. degree from the University of Mississippi School of Law in 1985. He was a member of the Moot Court Board and Phi Delta Phi Legal Fraternity. He has practiced law for 31 years with the family firm in Ashland. He is licensed to practice law in the states of Mississippi and Tennessee, the United States District Courts for the Northern District and Southern District of Mississippi and the Western District of Tennessee, the United States Courts of Appeal for the Fifth and Sixth Circuits, and the United States Supreme Court. He is a member of the American Bar Association, the Federal Bar Association, the Mississippi Association for Justice, the American Association of Justice, the Mississippi Bar and the Tennessee Bar Association. He is a member of the Tennessee Association of Criminal Defense Lawyers. He was a charter member of the Mississippi Attorneys for Constitutional Justice and served as Past President of that organization. He is a life member of the National Association of Criminal Defense Lawyers. He is a graduate of the Trial Skills Academy at the Institution for Criminal Defense Advocacy at California Western School of Law. He has been listed in the criminal law section of Woodward & White’s, Best Lawyers in America, every year since 2003 until the present. He was selected by Best Lawyers in America as Tupelo Criminal Defense: White Collar “Lawyer of the Year” for 2014 and 2016. He was listed as a Mid-South Super Lawyer in the field of criminal defense from 2006 until the present covering the states of Arkansas, Mississippi and Tennessee. He is actively engaged in the practice of criminal defense in both state and federal courts. He was the recipient of the 2009 Mississippi Association for Justice Least Weasel Award for the fierce representation of his clients and the triumphant fight for justice for all in the courtrooms of Mississippi, 2009. 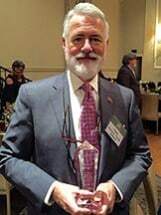 He received the 2014 Chief Judge Award from Chief United States District Judge Sharion Aycock for the U.S. District Court for the Northern District of Mississippi for his generous and talented service on the Court’s C.J.A. Panel. He is a Bencher in the William Keady Inn of the American Inns of Court III. He was elected as a Fellow of the Mississippi Bar Foundation in 2016. He served as a Ms. Bar Commissioner for the Third Circuit Court district from 2007 until 2010. He is also currently serving on The Mississippi State Bar’s Character and Fitness Committee. He serves as a member of the Board of Directors for Marshall Academy and has coached the Marshall Academy High School Mock Trial Team. He is married to Karen H. Farese of Ripley, Mississippi, and they have twins, Katherine and Michael, who are law students at the University of Mississippi. He is a member of the Beech Hill Church of Christ.